A set of train tracks follows the shoreline about 1/2 mile from our house, and every night the train blasts its horn as it crosses the road into civilization. At first it annoyed me, but now I kind of like the familiarity and consistency of the Alaska Railroad's late run. then made it look small and toy-like by tilt-shifting it. Too bad the horn isn't small and toy-like. Like most of your readers, I'd imagine, I have never heard of tilt-shifting. In which cases do you tend to use it? It certainly did make the train look like a model. I would have sworn that it was a miniature. We had a train that like to toot it's horn at 2:00am! I actually miss it since we moved to town! 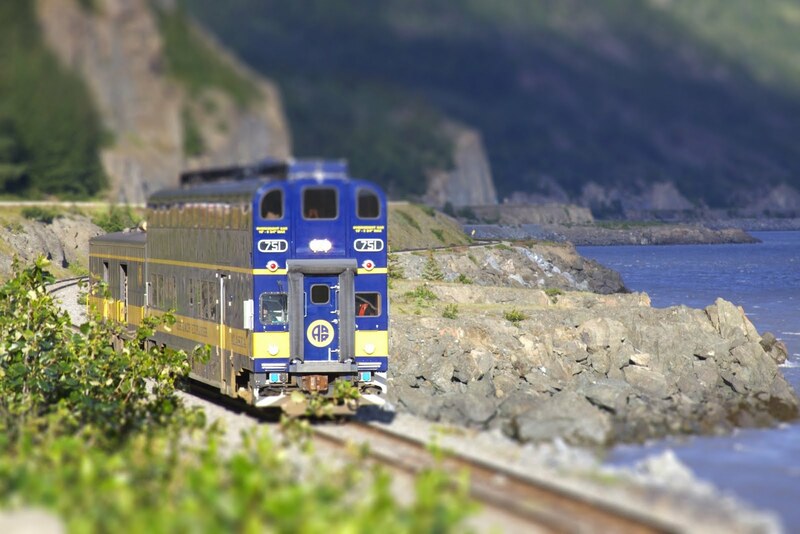 Michele: I've tried tilt-shifting a couple photographs and this train turned out the best. I think the vivid colors helped, as well as it being a vehicle. Boats, cars, planes, etc. usually look really cool when you tilt-shift 'em. People (especially faces) and animals don't really work. Dawn, are you sure we don't live in the same town?! Why does the train have to blow it's horn in the middle of the night? Is there really a lot of traffic on Alaskan roads at 2 a.m? Love the photo! At first, I did think it was a toy train. I can so relate to the train whistle. We live about a mile from some train tracks. It took some getting used to when we first moved into our home too. We live in the country, so at night when the train's make noise, we can really hear it! We don't have trains that come through at night, but we can generally hear some during the day. Wow, love the tilt-shifting! I also would have sworn that was a miniature otherwise - it looks so perfect! Ok that is too freaking cool how you did that to the picture. That really is a cool technique.